This has been a full weekend! We've been blessed to have all of our family here this weekend. 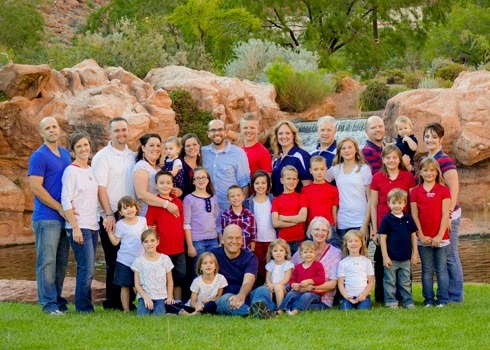 Last night we had family pictures taken at the entrance to Tuacahn. We did a total family picture and individual family pictures of our children with their children. We also had pictures of our children together, with and without Mom and Dad, and pictures of Grandma and Grandpa with all the grandchildren. After the picture taking, we came back to the house for dinner. The temperature was perfect, and we were able to eat outside, which is a good thing since there were 29 of us. We had a good time visiting and watching the grandkids play with each other. Later everyone retreated to their places of sleeping, whether their own home or a rented condo for the weekend. This morning we received a phone call from President Hansen asking if we could be set apart at 12:15 instead of 2:20 because the Stake President had a hectic schedule today. It was a blessing for everyone to move it up so those that were traveling could get on the road sooner. We crowded into a classroom at the chapel for the setting apart. 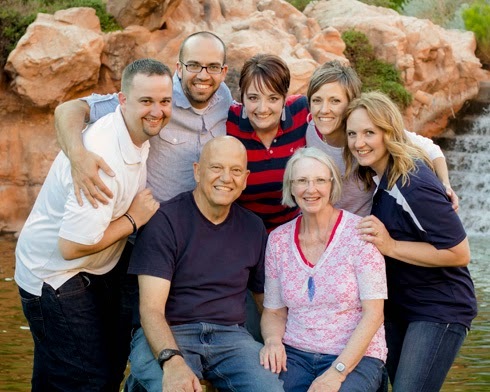 We were blessed to have dear friends there as well as the family. Sister Packer was there and Brother Elwyn Reeder, "Mom" Reeder's husband. (Mom Reeder couldn't come because she had broker her leg last week.) President Barney, our stake president, set us apart. I can't remember everything he said, but I was smart enough to ask our daughter to take notes, which she will transcribe and give to us later. After the setting apart, we met in the chapel with our ward choir to practice We'll Bring the World His Truth. Then it was time for Sacrament meeting. Beside our family and our ward family, we had many friends attend to give us their support. Visitors included my cousin MellaDee and her family, Brother Reeder, LuAnn, Roland & Nellie, Jeff Hafen, and others that I can't remember right now because I am tired right now. The meeting turned out well. Sherrie, I should say Sister Bodell, spoke about wisdom. Then the choir and family sang. It was hard to control my emotions directing, especially when the grandchildren started the last verse. Then it was my turn to speak. I managed to get through it, but it was difficult, with the Spirit at the meeting and my emotions running on max. My topic was example. I finished with my testimony in Malay. I had a really hard time getting through that. After the meeting we were able to visit with friends before heading back to the house to share a light lunch with family before they headed back to their homes. I was exhausted after most of the family departed for home. Amanda and family are still here, but I fell asleep for an hour of so. Things are winding down now. Life is good. We are excited to be heading to the MTC next Sunday after Sacrament meeting. There is still much to do this week, but we will get done as much as we can. Whatever we don't get done will be left up to Josh and Amber when they move into our house. Good luck to them! Tony, I was so excited to see your blog and learn about your mission! You and Sherrie will be amazing missionaries! One thing we love about being in AK is having the missionaries in our home frequently. Loved the pictures! Almost couldn't find the grandparents. We miss our Ivins "family".